These are the reviews for Oak Tree Lodge. There are 44 reviews. Oak Tree Lodge provided the perfect base for a wonderful holiday with our two young granddaughters.The setting is beautiful, on a quiet country lane on the edge of a small woodland and it is centrally positioned for easy access to the many children's attractions in the area. The cottage itself is very comfortable, clean and well equipped with a fully enclosed and secure patio area which was ideal for our girls. The hot tub was an added bonus and we all enjoyed relaxing in it at the end of each day. We will be back. We wanted somewhere in the beautiful Norfolk countryside - but not too far from a City - and Oak Tree Lodge fitted the bill perfectly. Definitely rural but with everything you need within walking distance (lovely pub, shop etc) and only 5 miles from the splendid city of Norwich. The Cottage itself was well beyond our expectations. Spacious, spotless and bright and with everything we could need. Alison (and her lovely dog Tilly) met us on arrival and was welcoming and able to provide useful information about the local area. The hot tub was superb and a perfect way to end the day with a gin and tonic in hand. We will definitely be back! A beautiful cottage with wonderful facilities. Welcomed with milk and a bottle of prosecco in the fridge. A very comfortable cottage which adults and children all loved. We would certainly recommend this cottage to family and friends. A lovely place to have a relaxing holiday. It was home from home and very private. The white horse pub did lovely food but we recommend booking in advance. Lovely owner and family. Beautiful cottage far beyond our expectations. Excellent property with good access to the broads and norwich. The cottage was very comfortable with some cosy extras and kitchen full of everything you need. The hot tub was an added bonus. Friendly owners. We would definitely return. I stayed here with some girlfriends for a long weekend and what a beautiful place this is and so well located! Only about 15 min drive to the town centre! Everything was immaculate and everything had been thought of. Alison even came to see us the first night to check everything was OK. The hot tub was also love especially with it being so cold outside and had plenty of privacy. Am hoping to return in the new year with my partner as loved the place so much! Thanks Alison for such a lovely stay! Cosy, well equipped cottage in a nice location. Had everything we needed for our stay, we even enjoyed the hot tub despite the November weather! The country lane off of the main road is hard to spot in the dark because it looks like a lay by but from there the cottage is easy to find. Fantastic stay at this cottage, the owner was very nice and welcomed us with all the essentials (and a bottle of wine) when we arrived. The cottage is extremely high quality, well presented and very clean! Lots of attention to detail, my two year old loved the DVD's & dolls house. Will definitely be going again. Super holiday lodge! Lots to do nearby and the lodge was a perfect cosy retreat to come back to. The owners have definately gone out of their way to make sure everything is just how you would want it. Would love to return! Absolutely fantastic find - so clean, well equipped, modern and homely with everything thought of for all the family. Lots of places to visit both local and further afield but the cottage is so lovely you dont have to worry if you stay in! Owners have got this holiday cottage spot on in every way :-) Looking forward to our return trip which we booked before we left! The lodge was great ,we had every thing we needed for the perfect holiday .Within easy access to many places Wroxham Sherringham Yarmouth and many more . The location of the lodge was perfect, on the edge of a common very private . The added advantage of a hot tub to relax in after a busy day out was heaven . Lovely accommodation set in a convenient location for exploring Norfolk. The owners were welcoming and friendly, the facilities at the lodge were excellent too. Especially enjoyed the hot tub! We had a fantastic holiday, thank you! We all had a fantastic time at Oak Tree Lodge. We would recommend this cottage to family and friends and would also go back. We had a great time, the cottage was well equipped for 6 people and the location was good for us. We plan to return next year. Stayed here for my sisters hen weekend and it was a truly wonderful cottage to spend the weekend in. The hot tub was amazing and the true highlight of our stay! The whole cottage was decorated beautifully and the beds were very comfortable! Overall a fabulous place to stay and we look forward to booking again. Oak Tree Lodge is an amazing property. The owners made us feel very welcome, they have created a relaxing and stylish retreat which we enjoyed immensely. Everything you could possibly need for your stay is at hand in this well equipped Lodge. The hot tub is a real bonus, our boys absolutely loved it! All the rooms are very spacious, comfortable and decorated with a luxurious touch. The fire was lovely and cosy, in fact It was a real pleasure staying in. We had such a lovely time we are already planning a return visit to Oak Tree Lodge. We have returned to London relaxed, refreshed and would like to thank the owners for sharing their lovely lodge with us for a week. We loved every minute! The accommodation was fautless and of an extremely high standard. A beautiful property which was light, airy and had modern décor. In a great position for exploring Norfolk. All you need for a comfortable relaxing break. The accommodation was fantastic and the location was great for beaches and shops. The children loved the hot tub. Overall a superb holiday. The cottage was spacious and well appointed. It was ideally situated just outside Norwich. We would not hesitate to recommend cottage to family and friends. A really lovely house to spend a holiday in. Modern and really comfortable, the pictures really don't do it justice. Highly recommended and definitely a place to return to with its quiet location. The accommodation easily accommodated our party. There was a delightful bedroom and superb bathroom downstairs, spacious and well furnished lounge with TV e.t.c and the kitchen was pleasant with good working space available. Outside, the spa was much enjoyed. The owners were caring and friendly. The Lodge is even better than the pictures. It is most comfortable, very well equipped and set up for a great getaway. Every comfort has been provided and all you need is to sit back and relax. Had such a fantastic break away in this beautiful peaceful cottage. The hot tub was the cherry on top. Perfect for adults and children alike, even our 2 year old adored it. It was a home from home. We will definitely be returning to Oak Tree Lodge. This property was very comfortable and ideally located for exploring the area. Having never been to Norfolk before I was extremely impressed with the accommodation and the area. The lodge is in an excellent location. Great decor and beds are so comfortable. The hot tub was a big feature for the whole family, great fun. We had a brilliant, relaxing stay at Oak Tree Cottage. We had everything we needed and it's a great location if you want to see some of Norfolk, only about 5 minutes from Norwich which is a must see place. This place really is a hidden gem. A little hard to find in the dark but apart from that we really couldn't fault. Some lovely little touches when you arrive - milk in the fridge, all little essentials are available (tea, coffee, dishwasher tablets). The accommodation is wonderful - warm, generously sized and comfortable rooms, good showers...and the hot tub really is a treat - we couldn't get enough...!! The area is great as well and this cottage is an excellent base from which to explore. We stayed at the lodge last week and I felt compelled to make time to write a review. We travelled with our just turned two year old and our 10 week old baby and were very pleased to find that the lodge had almost everything we needed on arrival (toilet roll, milk, washing up liquid, kitchen towel etc) so we could settle the kids in a little without having to rush straight out to the shops. There is a Hoover, washing machine, airer, all of the things you would have at home and had I realised this I probably would have packed a little lighter. A great deal of thought has gone into making this property a home from home, suitable for families with young children and it really does show. The lodge itself is very spacious and open plan whilst still feeling homely, the photos really do not do this justice. On arrival we were greeted by Mr Fox who was waiting for us in the hallway and this instantly made our Two year old feel very at home. The property is about a 15 minute drive from BeWILDerwood (which we all loved) and is probably about the same distance from Norwich City Centre. There is a nice little Park and are various eateries and shops all within a few minutes drive. The owners have compiled a very helpful information folder which tells you most of what you need to know about local amenities. The hot tub is wonderful and fantastic to relax in after the children have gone to bed. It is serviced daily. We tried to walk to local pubs via the common but found this impossible with the pram. A car is essential to stay here if you have young children. There were very strong winds during our stay and this resulted in a power cut one evening. This just so happened to be the evening of my 30th birthday and as such we were forced to have a candle lit takeaway without the distractions of modern technology. We followed this with a log fire and a glass of bubbly. Whilst we probably wouldn't have chosen to do this it actually turned out to be the most wonderful evening (although sickeningly romantic)!! The owners were very friendly, helpful and approachable! My only criticisms would be; Because the property is situated right on the common I found myself feeling a little vulnerable that someone walking their dog could just stumble upon us using the hot tub of an evening as it didn't feel very well fenced off. However I think that the owners have already considered this as there are young bushes that have been planted which in a year or two will have grown enough to provide some protection from the common. I must say my husband did not share my concerns and was insistent that I have watched too many strange films, that is until a dog came wondering by on our last evening and we could hear people calling out for it. There was another minor thing but to be honest I've spent so long reminding myself of all the good qualities that the property has to offer that I can no longer remember what it was! Needless to say it wasn't anything serious. Oak Tree Lodge was a holiday home done to a very high spec, and we were very impressed. It had everything you needed and more! The cleanliness was a 10, the amenities a 10 and the hospitality of the owners a 10. The hot tub made for very relaxing evenings. The location was perfect for so many different things. A day out on the broads, a visit to the coast, Cromer and Yarmouth and of course shopping and dining in Norwich. There are several superb local pubs to visit and truly worth it. The lodge is diamond......in the country. The cottage was very desirable and suited our needs extremely well. The hot tub and fenced patio were exceptionally nice as was the whole property. It was in a quiet area and close to the grocery store so we could get provisions. There was also a very nice pub within walking distance. Had a large interior for entertaining the English family that live within minutes of the cottage. It was very clean and we would definitely rent this property again. We are just fresh back from this beautiful area and accommodation. Despite being open plan the lodge feels cosy and warm - the luxurious underfloor heating helps and it is decorated to a high standard but felt welcoming for our family with a dolls house and rabbits on the grounds our girls were immediately drawn to! All of the bedrooms are superbly decorated with ample storage and two lovely bathrooms, one main bathroom downstairs and an en-suite upstairs. A small recommendation would be for the addition of a handheld shower-head upstairs, it's a bit tricky avoiding wet hair or showering young children and avoiding eyes in a rainfall shower. 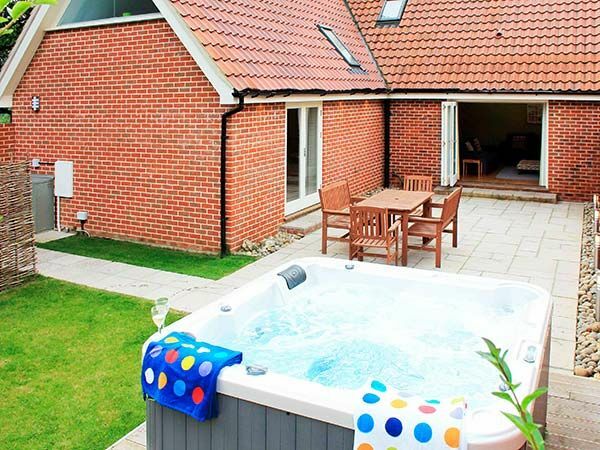 The HOT TUB is bliss, and serviced daily, and the local area has a lot to offer both close to the amenities of Norwich but a short distance from the beach and broads. We didn't meet the owners properly as they were on holiday themselves but we were welcomed with a bottle of wine which was a nice arrival gift. Note to travellers with small children for the twin room, bring a pressure fit stair-gate as the door is at the top of the stairs across a small landing from the master. The owner was very helpful, checked to see if we all OK on arrival. Property could not be faulted. All made for a good holiday. Oak Tree Lodge was very tastefully decorated, contemporary and upmarket. We really enjoyed our week at Oak Tree Lodge and would highly recommend it to friends and family. My only tip would be a hand held shower head,also a shelf or shower tidy for soap etc.The down stairs shower did not flow away enough. Loved this cottage. It was beautifully decorated and designed for families. They provided a highchair and also books for my kids to read. We loved the hot tub, such a great extra. Any family or couple would find this cottage relaxing and the owners were lovely. A fabulous setting and with a hot tub! Oak Tree Lodge was so spacious, well designed and with fantastic décor. We had a brilliant week and would recommend it to friends. The property was absolutely amazing, beautifully decorated and furnished and very comfortable indeed. It was very well equipped and every little detail clearly thought about. It was spotlessly clean and everything felt like it was really good quality. The owner was very helpful and friendly and a welcome pack of food and drink essentials was very gratefully received after a long journey. The hot tub was a lovely addition and really helped to make the property even more luxurious. We really couldn't have asked for more. The whole experience was excellent, from booking to the end of the holiday. This property was really comfortable, clean and well equipped. The tasteful décor and little touches like books and DVDs added to the comfort. For us, it was a bonus having a log burner and hot tub. The owners were pleasant and helpful, but not intrusive. We thoroughly enjoyed our long weekend here and are already planning our return trip. If you're looking for other cottages around Oak Tree Lodge, we've got some cottages below which may take your liking. 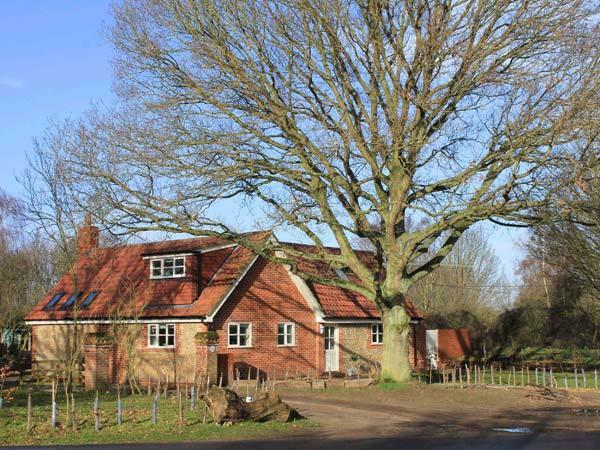 There are 66 cottages within 5 miles of Oak Tree Lodge - and they have reviews too.